That is the one quote in Roland Barthes’ A Lover’s Discourse that has been imprinted in my mind ever since I came across this brilliant and thought-provoking—yet admittedly difficult to read—masterpiece of a book. The thing is, I first read that line not in Barthes’ book, but—and this I admit without any ounce of shame—in this 150-peso chick lit, Mr. Write by M.D. Balangue, published by Cosmo Philippines. That quote intrigued me and I promised myself I would find its source and read it. I often tell people that reading A Lover’s Discourse is hard work. I remember abandoning it for months on end after I read the foreword and its first pages because it was such a trial to read. When I finally finished the damn thing, I realized the payoff is just worth ALL the effort and brainpower. And before I bore you with all this background information you can easily Google, let me tell you this: A Lover’s Discourse is arguably the best love-story-without-a-story ever told. Interspersed with excerpts from other literature and some of Barthes’ own personal musings, A Lover’s Discourse explores love by defining and pinpointing all of its nuances, complexities, types, stages, and permutations. 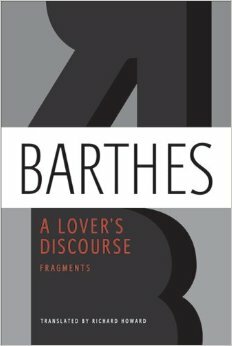 Using the tools of structuralism, Barthes studied love (and desire) as seen in the eyes of the lover: that first time you see your loved one, all sorts of feelings you associate with him (jealousy, sadness, longing, joy, desire), the realization that your love is unrequited, that bittersweet feeling after a love has ended, etc. Oftentimes, Barthes’ writing is painful to read—heart wrenching in its honesty and refusal to mince words. “Tagos sa puso” in Filipino. But that is just the way love is: messy, complex, and the source of both the ultimate happiness and the worst pain imaginable. I read this right after my boyfriend left me for another woman and I was like, “totoo ito, totoo ito!” the whole time. One thing that stuck with me is about his thoughts on jealousy; how a person is in fact in love with the other woman/man. A difficult but good read!